Ingredients: DBP- di-butyl phthalate is a skin irritant and may cause liver damage may cause spontaneous abortion in women exposed to it. Toluene - disturbs Woman's ability to reproduce & its linked to birth defects. Acetone is a skin irritant & makes cuticles dry & dull it makes nails brittle. How to use: clean your nails with nail polish remover , shape your nail . Choose the nail enamel which you want to apply . Before applying the nail enamel rub the bottle between your hands so that contents mix up well . Apply the nail enamel in 3 strocks .after drying up apply the 2nd coat . Background: Most nail enamels contain Acetone and Toluene that often cause skin irritation and lead to dull and fragile nails. 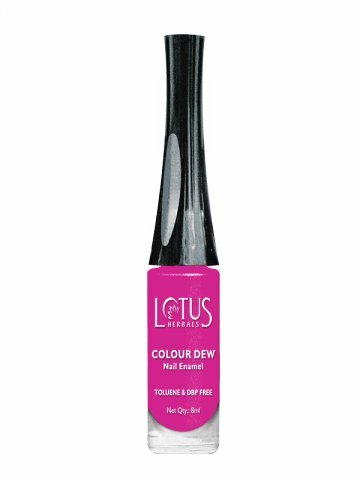 Colour DEW is a range of exciting nail enamels that are completely safe for your nails as it is Acetone, DBP and Toluene free. Packaged uniquely, it comes with a flat & sturdy brush applicator. And the best quality is that dries fast so that you are spared from the trouble of re-colouring your nails again and again.